The convenient beauty of a wireless printer is that a single printer could function for an office or household without a messy network of wires, all it needs is just some peripherals like Print Server etc. Mom can print while working on her laptop in bed. Your teen can print while working on homework out on the patio. The computers do not need to be attached to the printer by wire in order to print. This allows for greater resource sharing at the office as there is no need for workstations to be wired up to printers. While a wonderful feat of technology, the magic is quite simple, indeed. 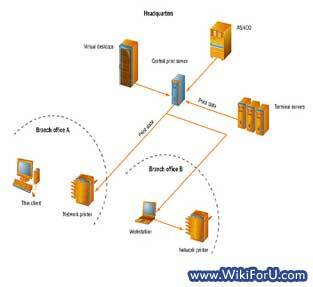 Also Read: What Is Wireless LAN? A wireless printer can be plugged into a convenient outlet, but it needn't be anywhere near the computer(s) to function. The key to successful operation actually comes from the computer itself. Before printing can occur, users need to “tell” the computer what printer to print to. This often involves selecting the model the appropriate printer from a drop-down menu. Once your computer recognizes the printer, the printer can easily be set as the default printer, the one the computer will print to automatically unless another selection is made. Of course, the home or office must be equipped with a wireless network. Yet, just as computers, tablets, and laptops connect to the wireless network, the printer can also be part of this digital network, too. The wireless printer, with its built-in connection capabilities, connects to the wireless network at its access point. This point of access is what eliminates the need for wires and cables. The transmission of data is shared over radio frequencies associated with your network—the invisible cables if you will. When a user wants to print a document or image from their laptop, for instance, they click print and the date is sent to the network router which sends it on to the printer. The wireless network is the hub that connects all the wireless transmissions. The wireless printer is not a one-way avenue either. It can also communicate with your computer by sending its data to the wireless router which forwards it to the computer. The computer user may notice a message like “please add more paper to tray one” or “the ink levels are low.” So long as the printer and computer are within range of the wireless network, this type of communication can occur. Today’s printers with built-in wireless technology can handle data pouring in from simultaneous computer submissions. It simply lines them up in the memory on a first-come first-serve basis. This is why it makes such a convenient option for homes and offices that have multiple computers. Because it can service various clients, multiple printers are no longer needed, which is a huge cost and energy savings. There are many wireless printers available today from office centers or computer stores. By reading the reviews, buyers will be able to choose a model that suits specific needs from photo-quality printers to heavy-duty office models that print efficiently in large volume. They all, however, share that great convenience factor—no more wires!